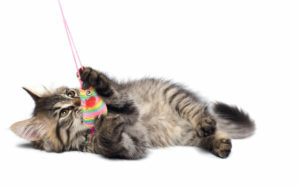 Kitten Kindergarten at Companion Veterinary Clinic allows your kitten to meet other kittens and learn the ins and outs of veterinary handling in a fun, positive environment. This class will also teach basic manners, such as sit and come, and discuss the prevention of common behaviour concerns, such as biting, litter box issues, inappropriate scratching – and much more! Contact Companion Veterinary Clinic for our next available dates and times!